When AAAS Fellow Karin Rodland pilots her Cessna 182 Skylane, she gains both altitude and perspective, using patterns on the landscape for orientation in the immense, empty sky. Back in her lab, Rodland's research is also guided by patterns. Her goal is to survey the big biological picture and zero in on cancer before it spreads. "I'm a big picture scientist," she says. "I look at lots and lots of big data, and I try to find the pattern. When you fly, that's exactly what you do—look for patterns." 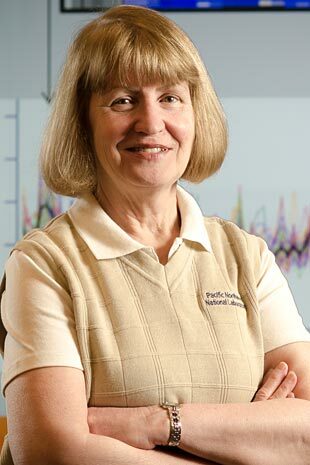 Rodland heads biomedical research at the Pacific Northwest National Laboratory in Richland, Washington. Part of a cadre of new cancer researchers, Rodland is capitalizing on recent advances in medical technology and the explosion in highly specialized medical data. Rodland is working on both fronts: She's helping to advance technologies used in the lab, and she's developing complex algorithms to sift through all that big data in the hope of finding cancer's threat signal in the noisy biological landscape. Her research could lead to a revolutionary change in how cancer is understood and treated. "If you detect cancer early, when it's a confined tumor and hasn't metastasized, you have a better than 90 percent probability of curing any cancer out there," says Rodland. Rodland's big-picture hunt starts with biological markers, or biomarkers. Whether it's the yellow tinge of jaundice pointing to liver failure or the red flush of inflammation suggesting infection, doctors and medical researchers have long relied on small biological clues to diagnose larger problems. Think of these biomarkers as smoke on the biological landscape. And where there's smoke, there's often fire. Though, as medical researchers like Rodland are discovering, this isn't a hard and fast rule. "We don't understand yet what determines whether a particular tumor is going to progress or just sit there," says Rodland. Rodland's research is focused on protein biomarkers. For decades, doctors have screened patients for cancer using blood tests that look for certain proteins that appear in large amounts. The obstacle for cancer researchers is that many commonly used cancer biomarkers don't explain a lot about the biological mechanisms that turn confined tumors into deadly attacks. For instance, when a test reveals the presence of elevated levels of prostate-specific antigen, or PSA, in a patient's blood, this only tells the doctor the patient probably has an enlarged prostate. This could mean prostate cancer—enlarged prostates are associated with the cancer—or it could mean the patient simply has an enlarged prostate. Only further, more invasive tests will tell if cancer has struck. These proteins once represented biomarkers at their best. Unfortunately, the proteins that are key to understanding how cancer forms are much harder to find. Unlike biomarkers such as PSA, these proteins tend to be more specialized, there tend to be fewer of them, and, complicating things further, these lower-abundance proteins can be masked by higher-abundance proteins. To locate and measure protein biomarkers, researchers like Rodland rely on the decades-old technology of mass spectrometry, which recently has improved by quantum leaps and bounds. Rodland is advising Pacific Northwest National Laboratory engineers who are designing better machines. New mass spec technology is helping researchers hone in on specialized lower-abundance proteins that point to cancer. Rodland compares the difference to flying on a cloudy day, having the sun break the cloud cover, and then being handed binoculars. Technology alone doesn't advance research. There's an analytical problem in locating these elusive proteins too. Solving it goes to the heart of Rodland's efforts, and it points to a cultural revolution in cancer research. "For years there were these two separate camps," explains Rodland. "People either focused just on what they were doing in the lab or they were analytical chemists and they generated lots and lots of data that they fed into a computer." On the analytical side, says Rodland, statistical researchers filtered from the data cancer biomarkers that were statistically significant, but that often didn't help advance the understanding of the biological processes. While lab biologists, in Rodland's words, were glued to their microscopes and "would ignore the universe of everything else." Basically, the big-picture researchers couldn't interpret the details, and the detail-oriented researchers couldn't see the big picture. Rodland's work is bridging this gap by taking working knowledge from the lab and transforming it into functional algorithms that are informing statistical tools to survey the mountains of medical data available. The work is expected to help doctors catch cancers early. "We're learning there's more to this than just watching a process run downhill," she says.